While it may not contain another trilogy title, this weekend does offer up a pretty high profile franchise sequel for audiences, with hopes to keep the to-date white hot summer box office going. 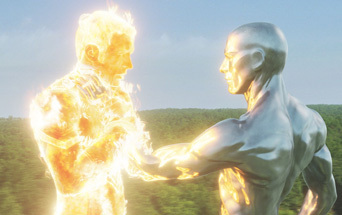 The Fantastic Four franchise might not seem like the best candidate to get the sequel treatment, seeing as how the first film was greeted with a collective "meh". There wasn't anything particularly bad about it, but there wasn't anything that great about it either. Wooden performances and unremarkable storytelling threatened to sink this franchise before it got going, even with a $56 million opening weekend. So, it's time to bring out the big guns for the second film, and it's right there in the title: The Fantastic Four: Rise of the Silver Surfer. In terms of the cool factor, The Silver Surfer undoubtedly has the highest cachet, even if he isn't quite as well known as a Spider-Man or a Hulk. A morally-ambiguous silver-coated alien arriving from space on a surfboard and wielding almost unfathomable power, he is one of the few comic villains to become a star in his own right. There's also an ace-in-the-hole that the film's ads aren't revealing in regards to his character, which, if you read the comics, you know about, and if you don't, far be it for me to ruin the surprise. Suffice it to say that the Surfer is a potential precursor to Earth's entire annihilation.